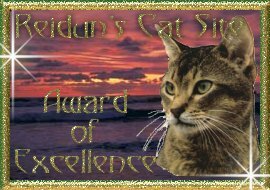 You have a nice page, and I hope you´ll like Reidun´s Cat Site Award !!! I visited your WebSite and found it to be outstanding in appearance and in content. Your effort to improve the wonder of the Internet is clearly reflected on each page. Please continue to move ahead with your talents. Lovely site..your Cornish Rex's are beautiful. Have a lovely day.